In this press conference Theresa May essentially expressed unconditional support for the Turkish State and declared that further arms-trade deals had been signed with Turkey, despite evidence and reports of Turkey’s wide range of human rights abuses both against its own population and across borders, particularly in the Syrian Kurdish city of Afrin that was invaded on the 20th of January 2018. 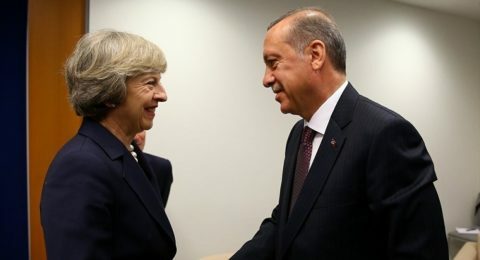 During her declaration of support, May, remarked on her support for Turkey while it experiences ‘extraordinary pressures from Kurdish terrorism’. We would like to express our unequivocal condemnation of the remarks by Theresa May. This level of racism in labelling 40-million people as terrorists is deeply worrying, especially in the wake of the rise of far-right groups across Europe, including the Turkish grey wolves, a notorious Turkish fascist group who believe in a pure Turkish Turkey and have been exposed while planning assassinations against Kurdish politicians and community leaders across Europe. Kurdish Community in the UK fears the racist remark of Theresa May will further encourage and give ground to racist attacks by extremist Turkish groups in the UK against Kurdish people. May’s comment is an unfortunate extension of Turkish President Erdogan’s rhetoric he uses to justify his massacres of thousands of Kurdish civilians in Turkey and beyond, it was this exact language he used to legitimise his invasion of the peaceful city of Afrin which has resulted in the murder of hundreds of civilians and forced hundreds-of-thousands to flee. As you know, the Kurdish forces have been the most important and effective allies of the international coalition in the fight against and defeat of ISIS in Syria and Iraq. The YPG-led Syrian Democratic Forces heroically defeated ISIS in their capital, Raqqa just 7 months ago and continue to defend humanity in their fight in Deir ez-Zor, while trying to defend the people of Afrin and assisting the people of Syria build a pluralist, democratic, ecological and gender-equal governance system. Kurds are not terrorists. The Kurdish community have been a crucial part of the vibrant migrant communities across the United Kingdom and with our local business, community centres and important cultural activities, have not just made important contributions to the richness of this country but are also a key contributors to the strength of our national economy. Many Kurdish people are proud to serve the people of this country as doctors, nurses, lawyers, engineers, teachers, activists, politicians, community leaders and academics like myself. This is why, the Kurdish community across the U.K. who make up core constituents in many areas of the country are deeply hurt and worried about the comment by Prime Minister Theresa May. We are worried we will be criminalised just for expressing we are Kurdish and attending demonstrations like those to protest the state visit of Erdogan. At the demonstration outside downing street on the 15th of May, 11 Kurdish people were arrested for simply protesting the state visit of a dictatorial leader. These arrests were as a result of deliberate provocations by fascist (they were continuously doing the fascist grey-wolf sign) Turkish demonstrators who were facilitated by the police on duty by being paraded past the Kurdish and Turkish demonstrators who were there to protest in the name of peace, freedom and democracy. We are holding a press conference in Committee Room 14, House of Commons to expose the racist comments of Prime Minister Theresa May. We would appreciate if you would be there to show your support to the Kurdish community who risk racist attacks as a result of the attempts at criminalising a whole population of 40-million people. Please come and say with us that the Kurdish people are not terrorists. At the PMQs that is scheduled straight after, we also ask you to question what the Prime Minister meant by ‘Kurdish terrorism’ which is a disrespect and betrayal of our the Kurdish community in the U.K. who crucial allies in the fight against ISIS who have sacrificed so much to rid the world of the evil of ISIS.